Breed 77 - They are a decent band. Don’t foresee me getting to see them however. With One Last Breath - Not really my thing to be honest. Royal Cartel – From what I’ve heard, this band have a few really catchy songs. I like what I hear. Ghost – Pretty awesome band. Really got into them since last year’s Download festival. I say really got into them, I listen to them occasionally. Shadows Fall – I quite like this band. Had exposure to them through being a Guitar Hero player and through WWE. They were due to play Portsmouth a few years back and cancelled. Would still like to see them. Feed The Rhino – Really quite like what I’ve heard thus far. There’s a chance I might be able to catch their set as well, which is helpful. The Dirty Youth – Initial response is a very positive one. They sound pretty damn good actually. Yashin - They seem alright but they aren’t amazing. I won’t be going out of my way to see them. Voodoo Johnson – Really like what I am hearing with this band. Sanguine – Not really my thing. The vocals are really off-putting. So all in all, one of those announcements that made me think “It wasn’t awful, but it didn’t cause me any further clash headaches” and so as a result, I am in favour! As I said earlier, I think the top two stages are done in terms of announcements and positioning. Because there is more to be added on the bottom 3 stages, I won’t be guessing those but the following is my guess at stage times for the Jim Marshall stage and the Zippo Encore stage. 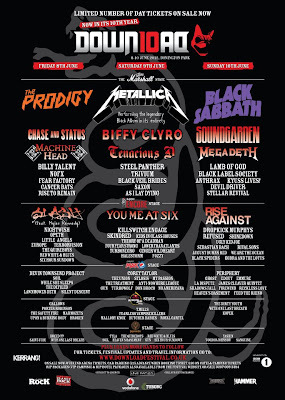 It has been said that the best laid plans of mice and men often go awry, but if I can pull off something even close to this, then I am going to have an amazing Download festival. Wait for the official times to come out now and give me a ton of clash headaches to deal with!